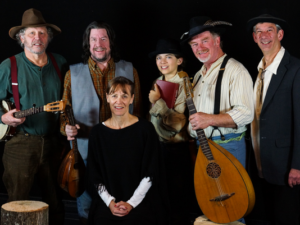 The whimsical play features a group of 19th century drovers traveling the Buncombe Turnpike who gather around a campfire to tell stories, play instruments, sing and, of course, drink moonshine. A Turnpike Sunset is historical fiction, with stories from the era of the Turnpike, as well as stories from Tom Godleski’s family (the playwright and founder of the Buncombe Turnpike band.). This show is filled with funny anecdotes, history, and live music performed by members of the Asheville bluegrass group Buncombe Turnpike. Authentically Appalachian!